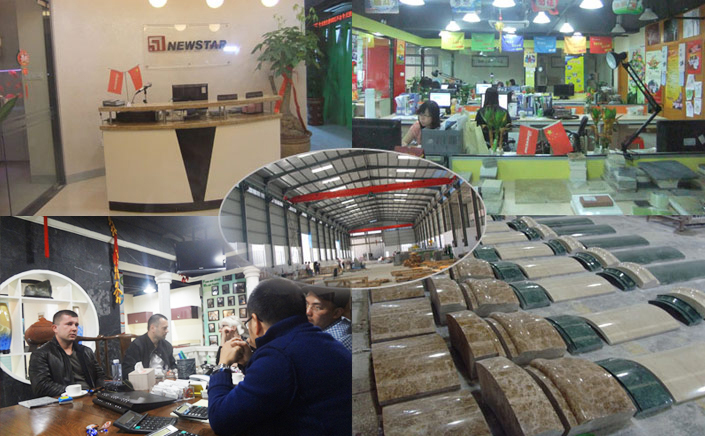 CHINA NEWSTAR STONE Presents the one of largest production of Natural Stone In China. More and more kinds Granite Marble Slate Pebble Sandstone Quartzite Stone we are offering, Whether where you can come from., friendly exporter and Manufacturer would supply what you like in stone! We enjoy working with you to supply and export all kinds of Products from china to you. Whether you are a wholesaler , a Distributor ,a retailer, a home/apartment/condominium/Hotel/Hospital builder or Architect or Owner ,always Newstar(China) would do our utmost to offer our best service and goods for you! We own our some processing factories & Quarries and more long-term supply and cooperation factories in China. All goods' price are competitive and quality are first! Tile & Slab Series- Granite Tiles & Slabs, Marble Tile & Slab, Travertine Tile & Slabs, Cut to Size and Random size with flamed (or blamed first ,then brushed), polished, Bush-hammered, Sandblasted ,mushroomed Beveled etc , these stones come from China, India, Brazil, Europe, Africa etc. Kitchen & Bathroom Series- Granite ,Marble, Travertine ,Countertops,Vanity top,Bar tops, Island top, Window Sill, Soap Dish,Tub Surround( shower Panel),Bath Tub, Stones Sink, Marble Vessel, Travertine Bowl etc. These are for Public area, restroom,Kitchen,Garden etc. WE have rich experience to pre-fabricate these products for Hotel, Hospital ,Apartment etc. Any drawing and photo can be made! Slate,Sandstone,Quartzite & pebble tile,slab, culture surface ,Roofing Tiles with various tiles- mushroomed surface, natural surface, tumbled surface ,Mosaic etc. This is Natural products for wall and floor! Building Stone Series-Sculpture, Carving, Paving Stone, cobblestone, Steps and Stairs,Tombstone, Gravestone ,Fireplace mantel, Medallion,Mosaic, Pattern , and any building ,decoration stone. Marble Special Items-Laminated Marble with Aluminum (honeycomb), Plastic, Ceramic,Granite etc. Onyx Marble tiles-onyx tiles, onyx with glass.